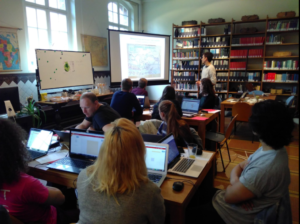 On Wednesday April 26, IPIS opened its library to host another Missing Maps Mapathon, in collaboration with OpenStreetMap Belgium. We happily welcomed 25 participants, including students from the Antwerp University and new and more experienced OpenSteetMap contributors. 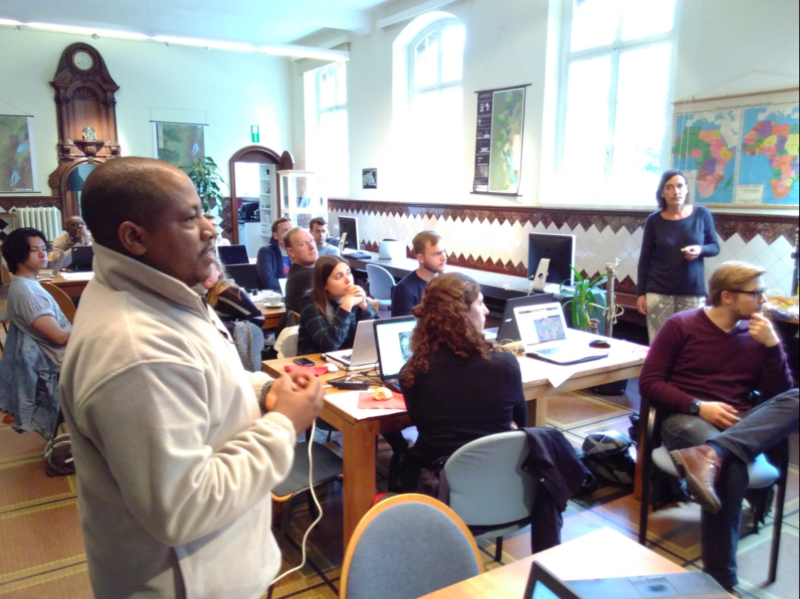 The evening started with a gentle introduction on how to trace buildings, roads and other features from satellite imagery. 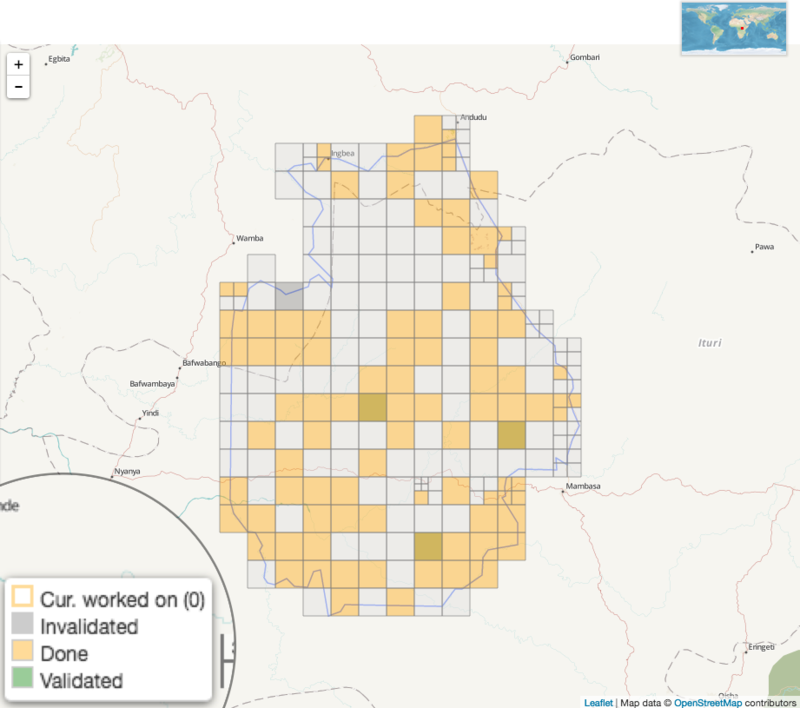 Then, using the HOT task manager, participants started working on tasks in Sub-Saharan Africa including Zimbabwe (mapping houses for the Malaria Elimination project) and Tanzania (mapping roads and residential areas for a Gender Based Violence project). 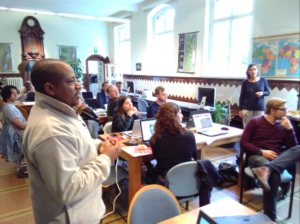 Once everyone was familiarised with the mapping process, the evening moved on with a more advanced and experimental task: mapping illegal activities, including mining and logging, in the Okapi Wildlife Reserve in DRC. Two employees of the Wildlife Conservation Society who work in the reserve gave an overview of the situation on the ground. Recent pictures of villages and mines were a useful reference for the attendants, as they set out to map the different features from satellite imagery. Thanks to the efforts of all participants, we managed to map 50% of the reserve by the end of the evening. 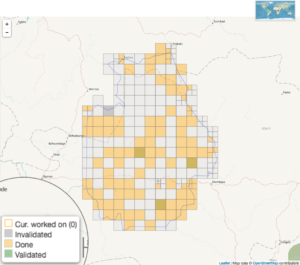 Experienced mappers will now validate the completed tasks to ensure the data entered into OpenSteetMap is as correct as possible. The aim is to complete this task by the summer, and use it as a baseline study to monitor the situation of the reserve. With the reported rapid increase of illegal mining activities and quick expansion of the number of residents in the reserve, comparing this data to future, more recent tracings from satellite imagery will enable us to quantify and study the evolutions in the reserve. Many thank to all participants, hope to see you again next time!